By that he means, of course, do not patronize facilities that display dolphins. Much of his work—and, indeed, the captive-dolphin industry—is centered around what goes on in Taiji every September, when local fishermen begin driving dolphin pods into a shallow inlet. The ensuing months-long slaughter, made famous by the 2009 documentary The Cove, kills thousands of dolphins for Japan’s dolphin-meat trade, while live dolphins are sold to marine parks and aquariums for as much as $32,000 apiece. For Ric, stopping this lucrative business is not just a moral imperative, it’s personal. In the 1960s, he worked for the Miami Seaquarium, training the five dolphins used for the popular TV series Flipper. Upon witnessing the death of Kathy, the dolphin who played Flipper most often, Ric became a passionate and outspoken campaigner against keeping dolphins in captivity. I was thrilled to be able to speak with him. Is captivity more stressful for dolphins than other animals? Yes, because they are sonic creatures—their primary sense is sound. If you go to the zoo, take a look at the reptile exhibit and find a snake. You’ll see that the snake is given more consideration than the dolphins at Marineland. You’ll see that the snake has got tree limbs to climb on, he’s got rocks to hide from the public if he wants to, grass—there’s always something natural about the snake’s habitat. But if you look at the habitat of a captive dolphin, you’ll notice there’s nothing there. It’s just a blank, concrete box. Is that stress? Of course it is. Why can’t marine parks create better environments for dolphins? It’s really not what’s best for the dolphin; it’s about getting people to come and watch a show, and then getting another group of people to watch the same show. Even the best of the bad ideas, SeaWorld in Orlando, has concrete tanks. There’s no way you can fix that. The dolphins are separated from the natural rhythms of the sea: the tide, the current, the sounds of the sea, the things we take for granted. All of that is missing. That is what we call sensory deprivation. That makes it more stressful for them than other animals in captivity. You’ve been doing this for four decades now. Are you seeing any progress? 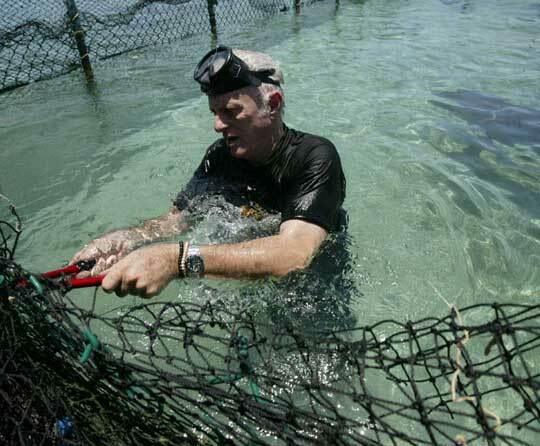 Ric cutting chain link fence to let dolphins escape. Photo by Daniel Morel. Yes. I am seeing great progress, and that’s really what keeps me going: measureable results. For example, when I first started campaigning in Germany, there were 12 or 15 dolphinariums. Today there’s only one left. It’s easier in Europe, because people are better educated. In 2011, I received a Bambi award, and it’s a live event. Fifteen million people are watching this in German-speaking countries. It’s like the Academy Awards. I had several minutes on TV to look right into the camera, explain the problem, and say, “Please don’t buy a ticket!” It’s based on supply and demand, like any other product, and we as consumers have the power. And it’s working. People are getting the message. Two dolphinariums in Germany closed since then. Can governments step in to speed up progress in other countries? Governments aren’t going to close dolphinariums. Governments protect corporations; they don’t protect people and other animals. Like the National Marine Fisheries Service, who were supposed to uphold the Marine Mammal Protection Act. They’re actually a part of the Department of Commerce. Commerce’s job is to facilitate commerce; they have a mandate. To tell them to protect dolphins and facilitate commerce is like telling them to stand up and sit down at the same time. So the system doesn’t work; it’s an inherent conflict of interest, and the only hope is consumers. That’s what I do: try to get to the consumers. Please tell me about your campaign in Taiji. When we’re in Japan on September 1st, the message is, Don’t buy this dolphin meat. If the Japanese people learn that the product is poison, they will stop buying it. As a matter of fact, in the last four years, the killing has dropped dramatically because the demand has dropped off dramatically as people learn that the product is contaminated with mercury. I’ve been going to Japan four or five times a year since 2003. I’ll be back there September 1st; we have two busloads of people from around the world who are going to meet us there. We have 93 cities that are going to be protesting on that same day. We’re just trying to keep Taiji and this cove in the news. You know, it’s hard to keep any issue alive in the media; they move on to other things. We’ve been lucky to keep that issue alive, and when we show up September 1st, there’ll probably be 100 people from the media there. We’re just trying to remind the media that today is the day that the largest slaughter of dolphins in the world begins and will go on for six months. Do you ever feel physically in danger there? Well, I am physically in danger; there’s no question about that. The police have told me that. The fishermen themselves have told me they would kill me if they could. They probably wish they had back in 2003, because it wouldn’t have been a big news story. But today they probably wouldn’t do that because it would bring too much attention to them. I have a very high media profile in Japan now. It offers some protection, but it doesn’t offer protection from, you know, the young yakuza wannabe who wants to make a name for himself. Or some drunken fisherman who makes a bad decision and does something stupid. When “The Cove” won the Academy Award for Best Documentary Film, director Louie Psihoyos, producer Fisher Stevens, and star Ric O’Barry took to the stage. 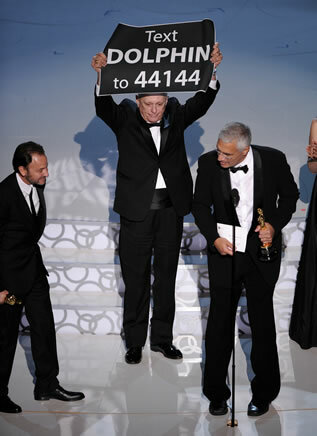 As Psihoyos and Fisher accepted their Oscars, Ric held up a banner reading “Text DOLPHIN to 44144.” Over the next 24 hours, so many people sent the text message petition to President Obama and the Japanese prime minister that, Ric says, the system crashed. Associated Press photo. Are you seeing a decrease in dolphins taken for captivity in Taiji? No, I’m seeing an increase in that. I’m sure we’re going to stop the killing. It takes the captivity industry to stop the captures. They could do it anytime they want to, but they refuse to get involved and police their own industry. The World Association of Zoos and Aquariums, the AZA, the Alliance of Marine Mammal Parks and Aquariums, SeaWorld—it’s a multi-billion-dollar industry. They just want to look the other way and pretend it doesn’t happen. Why the increase in captures? Most of the dolphins captured at the cove are taken to facilities in Japan. Japan is the size of California, and it has 51 dolphin abusement parks—51. It’s amazing. That’s more than all of Europe. They are substandard facilities. They are disposable dolphins for a disposable society. The fishermen capture them and drag them there kicking and screaming, they keep them for as long as they can, the dolphins die, they dump them, and they get more from Taiji. That’s why the captures continue. Also, China and Turkey are big markets. Aside from not patronizing facilities with dolphins, what can people do to help? They can go to our website. We don’t have a huge fan base like Sea Shepherd or the Humane Society. We’re actually quite small. We’re understaffed and underfunded. If you want to help, just go to DolphinProject.org and make a donation. My thanks to Ric for taking the time to talk to me. In addition to visiting his website and contributing, you can like Ric O’Barry’s Dolphin Project on Facebook and follow them on Twitter: @dolphin_project. You can also forward this interview to family and friends! Welcome to the official blog for Striking at the Roots by Mark Hawthorne, your source for interviews, profiles, and advice for more effective animal activism.